Statik Selektah dropped Lucky 7 with his customary superb production and the illest feature lineup around. A staple to his recent projects has been pairing up lyrical emcees who haven't been on tracks together. Action Bronson and Joey Bada$$ are not in the same "camp" as Statik, but the producer has grown to have a strong relationship with these two budding emcees. This relationship has lead to the Boston producer frequently having them appear on his projects. 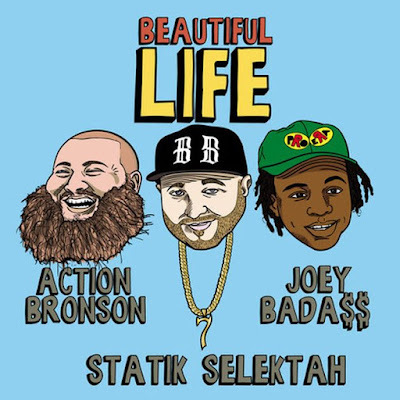 Beautiful Life links Bronson and Joey for a feel good lyrical trip that takes us from them being underground emcees to their rise as super stars. Taking visual cues from Jay Z's Big Pimpin', Statik and the duo rap aboard a yacht, jet skis and ATVs, and finish off in their concert overseas (we assume overseas). So, want two of the dopest lyricists on a Statik track? Check. Want them to do a video? Check. Peep below and def check out the rest of Lucky 7. All material is the expressed opinion of the authors; all rights reserved. Simple theme. Powered by Blogger.